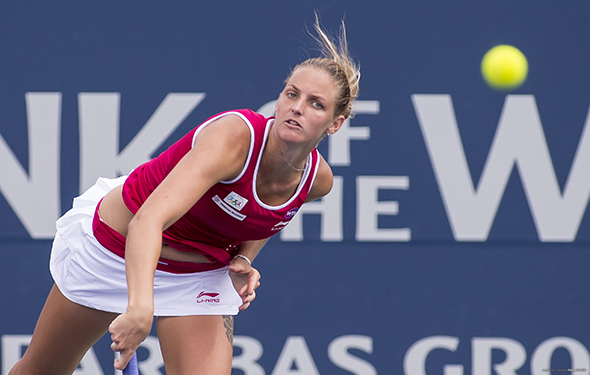 FROM TORONTO, THE ROGERS CUP, WEDNEDAY, AUGUST 9: Karolina Pliskova is now No. 1. But she hasn’t won a Grand Slam yet, the monkey also on the back Caroline Wozniacki who went years with that notorious distinction. Obviously, this situation can be awkward, because she has come close to winning the major, like last year at the US Open, when she lost against Angie Kerber, 6-4 in the third. She didn’t choke, but she hesitated, and she got a little bit nervous, and she backed off. Pliskova is so much more consistent now. Three years ago, when she wasn’t playing well, she would check in and out. Now, she is composed and can keep her flat shots in the court. Her consistency has increased and she can mix it up, deep and very short, and on the lines. “I feel more experienced now,” she said. This season, she has been pretty good, but not great. She won Brisbane, but then she lost in the quarters against Mirjana Lucic-Baroni in the Aussie Open. She won Doha, beating Wozniacki. At Roland Garros, she reached the semis, but then she went down to Simona Halep in three sets. On grass, she won Eastbourne, taking down Wozniacki. At Wimbledon, in the second round, she lost to Magdalena Rybarikova. Bye-bye. She will play against Naomi Osaka on Thursday. Wozniacki and her close friend Aga Radwanska will face off on Thursday. They have played each other 16 times, with the Danish being a little bit better, up 10-6. In 2016, Wozniacki beat her in Tokyo, 6-4 in the third. In Wuhan and Beijing, Radwanska was the victor. In 2017 in February, Caro beat Aga in Doha. Last year, they were both pretty hurt but are in much better shape now. We say it’s 50-50 between there fantastic friends on Thursday. Venus Williams will go up against Elina Svitolina tomorrow night. Venus came pretty close to winning Wimbledon again, but she is getting slower. While her first serve and backhand are phenomenal, her problematic forehand is still up and down. She is better than Svitolina. Maybe Venus is looking to grab the No. 5 spot from Svitolina. … Garbiñe Muguruza was so-so last week, but she is incredibly confident. She can still get too frustrated. Can she win Toronto and the US Open? Maybe, but first off, she has to face Australian Ashleigh Barty who is getting better and better. … Sloane Stephens is back, upsetting Kvitova 76 36 62. She was out for nine months but returned at Wimby and now showing constituency and strength again.